Johann Baptist Vanhal (1739–1813) was one of the most prolific composers of the string quartet during the last third of the eighteenth century, with David Wyn Jones authenticating over fifty of the quartets that appeared under Vanhal’s name. The six quartets of opus 33, published in 1785, were among his late works in the genre. The first movement of String Quartet No. 6 in B-flat Major begins with an Adagio introduction in 2/4 followed by an Allegro moderato exposition in 3/8, but rather than repeat the exposition the music returns to the Adagio, which itself is varied and extended and takes the place of the expected development section. The next movement presents a minuet and trio that are titled “Arietta I” and “Arietta II,” respectively, with an air of unassuming dignity in the minuet and a lilting, dotted rhythm to carry the trio contentedly along. The final movement, the third, begins in 2/4 as an Andantino in F major with every instrument marked delicato, e dolce. After a contrasting middle section in B-flat the initial key and music return to round out an ABA form. Then a transitional passage ends on a fermata with a chord that is notated F-A-C-E, but in which the E should surely be flatted to create a dominant seventh chord, which leads to the return of the B-flat Allegro music of the first movement. This Allegro presents in itself a complete binary form with both parts marked to be repeated, but the familiarity of the material allows it to be curtailed to create a satisfying close to the work. 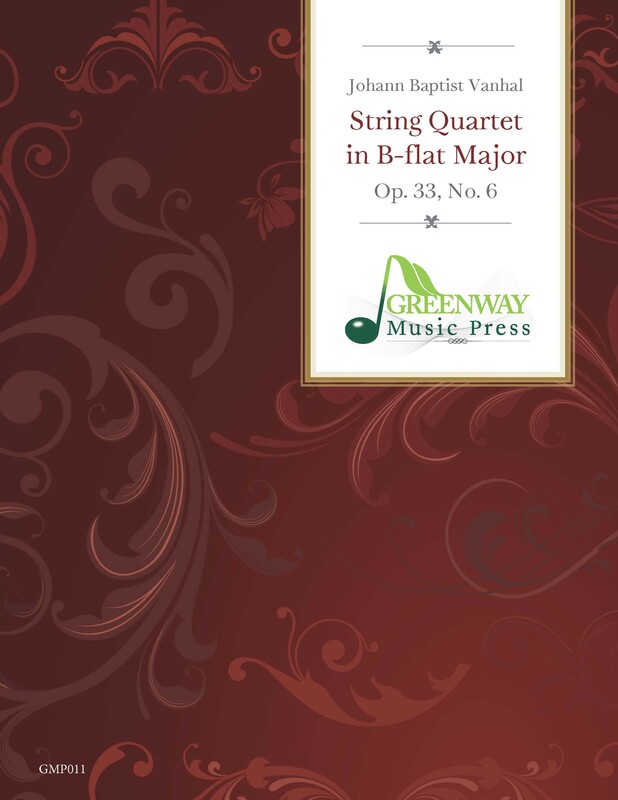 The present edition includes a short preface, statement of editorial methods, and critical notes and offers the quartet in a study score along with performance parts. It is based on the copy of the original Artaria parts held by The British Library, London.